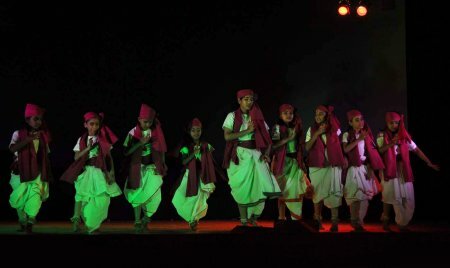 On the 13th & 14th May 2010 (at Rabindra Mandap, Bhubaneswar), the Orissa Dance Academy held its 26th Annual Day function aptly titled "Nrutyambada." The title implies the dancer telling the story of his/her own evolution. As expected, presently from the ODA and the organizing skills of its Director Aruna Mohanty, the 2-day celebration of dance went off smoothly. At the outset, it was very heartening to see the auditorium packed to the brim on the first day. 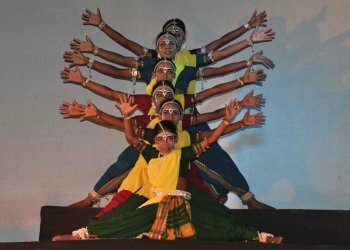 The generous attendance of parents and well-wishers of the performers who had come in droves to encourage them, struck a pleasant note and reminded one that the audience for Odissi dance in its native place has not diminished, but it's actually growing; for a quality program of dance and music, one can still expect a sizable and enthusiastic audience in Bhubaneswar. The dancer community can certainly take heart from this. This first day saw as many as 9 items performed entirely by the students of ODA. The 2nd and concluding day featured 8 items of dance which followed a report projected on the screen, of the institution's year-long activities and performances which was followed by the notable feature of the evening – an Odissi dance drama titled "Basudha." Although this presentation was studded by a set of experienced dancers of ODA, their efforts hardly got any meaningful support from either the lighting design or the back screen video projection. 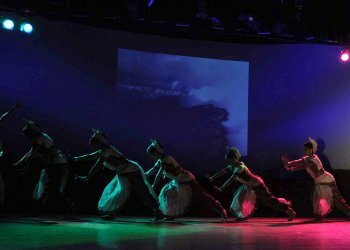 Adapted from Radhamohan Gadanayak's masterpiece 'Basudha' by Kedar Mishra, the piece was choreographed by Guru Aruna Mohanty with music by Sukanta Kundu and rhythm direction by Guru Dhaneswar Swain. While the dancing itself was adequate, it would have been useful if the subject matter of the dance drama could have been more firmly established in the understanding of the audience. The process of delineating the story line could have been greatly helped by the projected visuals on the cyclorama. But this did not happen to the extent desired since the heavy ground lighting of the fiberglass stage frequently enveloped the back screen with a haze, thus blurring the visual so painstakingly prepared. The initiatives and care taken by the ODA in using props like fiberglass stage and the cyclorama projection, is commendable. But such props need to be managed skillfully when used in tandem. If this had happened here, the full impact of the masterpiece 'Basudha' would have been experienced by the audience. Given the impressive cast of the dancers in this presentation, the most outstanding performance, albeit in a relatively small role, came from Madhusmita Mohanty (Dimple). The following item, an Oriya abhinaya based on the song 'Bajuchhi sahi baajaare to naare Braja bajaare' was presented by Nabonita Pal. Being a Bengali girl based in the USA, Nabonita endeared herself to the audience by giving an introduction in Oriya; this little extra effort by the dancer was highly appreciated and set the mood for a good and competent performance. This dancer shows a lot of promise and her skillful emoting can be further perfected with growing experience and maturity. 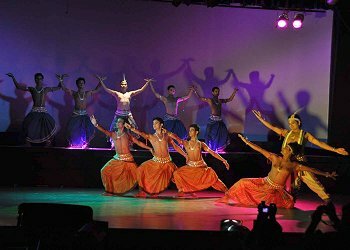 The choreography was a collaboration between Gurus Gangadhar Pradhan and Aruna Mohanty, with music composed by Bijay Kumar Jena. The other noticeable item of the evening was a Pallavi titled 'Nrutya Vilasa' executed deftly by the students of ODA. It was an enjoyable pastiche of Gotipua and Odissi styles. 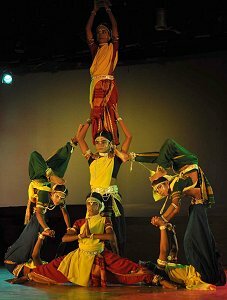 Choreographed by Bijaya Sahoo, a senior dancer of ODA, the experiment succeeded in seamlessly stitching the rigourous acrobatic (Bandha) movements of the Gotipua with lasya elements of classical Odissi. The choreographer's imagination deserves applause. There was, however, a perceptible irritant in the Mardala accompaniment to this piece. The speed of the Mardala playing showed an undue haste and lack of consideration for the capacity of the very young dancers in the group to keep pace with the steam-rolling rapidity of the Mardalika. That the young dancers could not keep pace with his frenzied playing was no fault of the dancers at all. An accompanist of his experience needs to take greater care when playing for such young dancers. The music composition was by Guru Ramahari Das with rhythm design by Guru Dhaneswar Swain. The subsequent items of the evening were quite satisfactory, showing good form and preparation on the part of more than 150 performers. On completing 26 years of continued activity, the ODA institution needs to be congratulated.